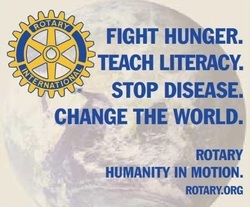 Rotary is a large and multi-faceted organization. Here are some ways to learn more about Rotary International. • Read every issue of your Rotary magazine (comes with membership & is at the local library) and your club and district newsletters. In addition to reporting the latest, Rotary news provides district Web site links and information about RI and Rotary Foundation programs. You can also use the site to conduct much Rotary business online, including registering for the annual convention and making contributions to the Foundation. RI offers a wide range of resources for Rotarians, including publications covering all aspects of Rotary and its Foundation. View the online catalog of these materials. Every club also receives a print version of the catalog with order forms; our club secretary should have our club’s copy. the online Club Locator tool or the free mobile Rotary Club Locator app.